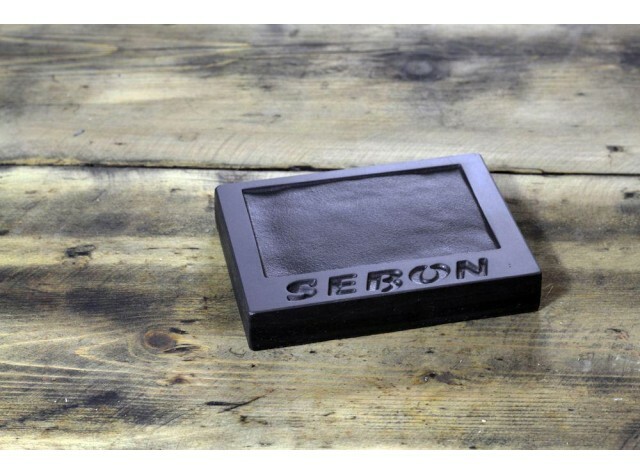 Handmade Welsh slate soap dish, deep engraved with the word 'Sebon', which is Welsh for soap.Pair with a bar of our handmade, 100% natural soap for a wonderful gift, which will look fabulous in any bathroom. Handmade Welsh slate soap dish, deep engraved with the word 'Sebon', which is Welsh for soap. Pair with a bar of our handmade, 100% natural soap for a wonderful gift, which will look fabulous in any bathroom. 500 million year old Welsh slate from Blaenau Ffestiniog. Valley Mill has been manufacturing Welsh slate gifts and homewares since 2007. From designing laser engraved Welsh slate gifts in his spare room, Kevin Thomas has been designing and expanding his range of handmade products for over 10 years, which includes Welsh slate and Welsh Oak home ware, home fragrance and natural soaps. Valley Mill also handcraft Welsh slate house signs, wedding signage and favours, trophies and memorials.